In a one-two punch for Japan mobile tech watchers on Monday KDDI announced 10 new models for the companies spring 2008 sales campaign. 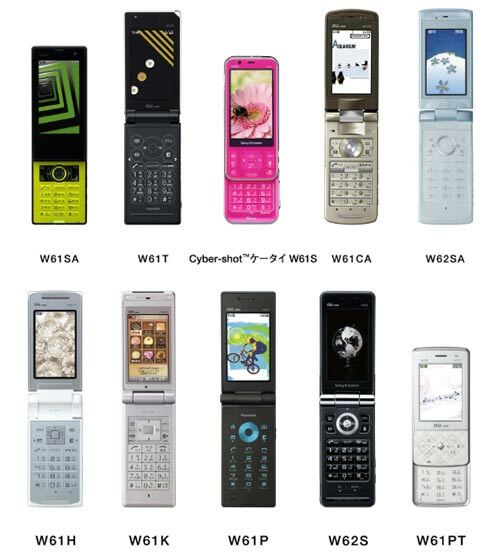 The line-up includes models from; Toshiba, Sony Ericsson, Kyocera, Panasonic PanTech&Curitel, Casio, Hitachi, and Sanyo. For those lucky enough to be in Tokyo the ultra-trendy Designing Studio in Harajuku will have the whole fleet on display for touch & try. Flash Gallery Here and more details after the hop. It enjoys an active life of sports etc. comfortably. Waterproof cellular phone for "au Smart Sports"
equipped with 5M camera & Wanseg. Smarter, it is more comfortable. It has evolved. beautiful illumination and easiness to use exactly. large screen and built-in antennas, and "Thin type"
Wansegcatai of thinness about 12.9mm. countries in the world and regions. the main body and downward downward in a past slide style was achieved. that opens the slide, and to operate it comfortably. It is possible to take delight in music wireless equipped with Bluetooth(R). The media function of enhancement is condensed. and , media function has been enhanced. Bluetooth(R), and a workout in easiness. wireless if the Bluetooth(R) head set (optional) is used. "Au one gadget", and "Multi play window"
It is possible to enjoy even by "Walkman" and the HDD component "Nettojuc"
..sound.. long time faithfully to an original sound was achieved. display two functions at the same time as EZweb is seen while seeing "Wanseg"
discontinuity deposition, aluminum, and the tempered glass use, etc. is pursued. to the lifestyle, and to use in addition. program is convenient more and more of the preset and the retrieval. application program, Bluetooth(R), and a workout in easiness. "REGZA" (note 4). "Natural color" and "Vividness"
as for tone quality. It is a business mind as for three patterns (and BASS･WIDE). It can enjoy "Wanseg" comfortably. calendars and the photo slides on the idle screen at any time has been enhanced. "Smile shutter Lite" that obtains the smile of "Face Kime Lite"
leave it particularly by a beautiful image. The sensor made by Sony CMOS "Exmor"
correction function and ISO1600 high sensitivity taking a picture. screen TV in the beauty of the truth. taken with large screen TV. can display two functions at the same time as EZweb is seen while seeing "Wanseg"
Design that expressed a sense of existence as camera. It enjoys an active life of – sports etc. comfortably. colors with good sports fashion and compatibility by the feature. about rain of the destination such as running (note and can handle it. outdoor in the shower booth. enjoy various movements and stories with the menu panel and the wallpaper. the favorite matched to the lifestyle, and to use in addition. The so on convenience function for "EZ Felica" is enhanced, too. It has evolved. "Waterproof Wansegcatai"
It is possible to use it in rain (note 13) sudden ..the bathroom (note 12)..
enjoy "Wanseg" on a large screen though it is a compact, smart style. achieved the thinness 19.5mm while installing it. arrangement is a preset a little. of 2.8-inch wide QVGA and "FM transmitter". of 2.8-inch wide QVGA by the best image quality. it enjoy music more easily by various scenes. It is "au Smart Sports Run&Walk" and a workout in easiness. three colors of Brown who chicly has the fine quality feeling of the depth. "Silhouette screen" of electronic paper. quality like the glass on the back side. In addition, "Crystal white"
sheet key of a large-scale button was adopted. Image quality processing engine "Picture Master for Mobile (note 15)"
installed, and it enjoy "Wanseg" by a beautiful image quality. Moreover, built-in Wansegantena is adopted. phone (R) is used illumination. ..strapping.. character. Everyone is for an easy-to-use, friendly design. For friendly design that aims at cellular phone to which everyone is easy-to-use..strapping..
etc. can be easily confirmed. Night is also safe in the fake arrival of a message. purchase, it is possible to use it in the best shape for the customer or more. Wansegantena with built-in liquid crystal & that sees brightly easily. long time according to recording and the favor has been enhanced, too. Only thin squids are remarkable value, and are equipped with "Wampsshuorpn". synchronizes with Wampsh is also possible. even making a passage foreign countries (note 21). said that there was feeling of luxury when taking it. and the character to input to use was pursued. assortment of a happy function. be emitted, it can easily enjoy the lesson of the foreign language. function that can be conveniently used has been enhanced. possible to use it easily by ..length.. ..O.. doing the sending key. backlight for which beauty and the visibility are secured by uniform brightness. A necessary function is fully loaded to a compact body. service of WIN such as "PC site viewer" and "EZ Nabis walk".